Ideum - a multitouch software and hardware development firm - has announced a major update to the world's most advanced multitouch authoring solution. GestureWorks 2.0 now has built-in support for over 200 hundred gestures. By 2015, ARCchart forecasts that over half of handsets will support touchscreens of various types, creating a market of almost 900 million units. Integrated Device Technology, Inc. (IDT), an Analog and Digital Company delivering mixed-signal semiconductor solutions, announced a true single-layer multi-touch projected capacitive touch screen technology for screen sizes up to five inches. I like the term "multi-dimensional multi-touch". IUP has interviewed 340 participants in nine countries and draw several interesting implications about multi-touch gesture interaction. Excerpt: "The electronic skin uses evaporated gold as a conductor. Researchers have created an electronic touchpad that can be pulled like a rubber band. Yet it responds to touch and pressure." Touch International shared me a helpful article to understand projected capacitive touch technology. 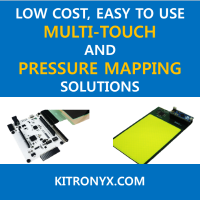 More white papers about touch technologies can be found here. Hitachi has given a demonstration of a new capacitive touchscreen that could allow touch without needing direct finger contact. The surface still uses projection to catch the input but can recognize not only a thin layer in between, such as cloth from a glove, but also completely inanimate points such as a pen or a fingernail, Japan's Nikkei BP learned. >> "The Credit Card for the Blind looks complicated but is quite simple to use. It uses the cardholder’s fingerprint (using fingerprint recognition software) as their signature and the Braille on the display for transaction details." The buttons take the form of tiny nubs attached to a sheet of plastic much like a screen protector. These are placed on the touchscreen over where the D-pad and buttons would normally be displayed by a game. Then you just play as normal tapping the buttons as you would the screen. Excerpt: Jobs put a damper on the speculation today saying, "We've done tons of user testing on this, and it turns out it doesn't work." When it comes to touchscreen devices, we’re not making the best use of our fingers. It's a more realistic version of multitouch R.U.S.E game. Since I’m a little tired of using Wacom Bamboo Fun Pen & Multi-Touch, I made up my mind to fully dissect the poor toy. First, let’s remove four bottom screws. We first see a mysterious metal sheet. After removing the sheet, another mysterious white paper appears. This is a photo of backside of Wacom’s EMR pen sensing panel. It has many vertical strip lines. Now, let’s move to its front side. Here, we see hundreds of horizontal strip lines. Since we have toured pen sensing panel, now it’s time to proceed to the touch panel. The touch panel is attached right beneath the cover of Bamboo Fun. The touch panel has diamond shaped electrode patterns. Let’s see the face of the touch panel. Here’s all the parts. Wacom's Bamboo Fun Pen & Multi-Touch has two panels – one for finger touch and the other for pen touch. It's an old but interesting concept design. Thanksfully, the author provides board schematics and demo applications. This post lists e-book reader devices of various companies.